Journalist and activist Christo Anastas Dako (1878-1941) emigrated to the United States from Korça in 1907. There, he vied with Fan Noli for leadership of the Albanian community in Massachusetts, and in 1913 became president of the Vatra federation and editor of its principal organ, the Boston weekly “Dielli” (The Sun). He was the author of school texts and works of political history such as the essay “Cilët janë Shqipëtarët” (Who Are the Albanians? ), Monastir 1911; “Albanian, the Master Key to the Near East,” Boston 1919; the short historical study “Liga e Prizrenit” (The League of Prizren), Bucharest 1922; and in later years “Shënime historike nga jeta dhe veprat e Nalt Madhërisë së tij Zogu i parë Mbreti i Shqiptarvet” (Historical Notes from the Life and Works of His Majesty, Zog the First, King of the Albanians), Tirana 1937, translated by the author into English as “Zogu, the First King of the Albanians: a Sketch of his Life and Times, Tirana 1937.” In 1914, just before the outbreak of the First World War, Dako was back in his native Korça. In the political chaos of the times, Greek troops invaded and occupied the town and much of southern Albania, causing crimes against humanity on a massive scale. He and his wife Sevasti Qiriazi-Dako (1871-1949) fled for their lives to Romania. Before doing so, Dako was able to send this report on the grave situation in southern Albania to Aubrey Herbert (1880-1923), head of the Albanian Committee in London. 1. The Moslem village of Qinam with 55 houses was burned May first. Only 8 houses remained out of the whole village. The following old people were massacred and mutilated in their homes, Mr. Zulfo Murat, 60 years old. The niece of Zulfo Murat, 21 years old, outraged, her throat cut and horribly mutilated. Captain Ghilardi has seen the bodies of all these people. 2. Selenitza, 60 houses, ten of which are Christian, the rest Moslem. All the Moslem homes, except four, were burned May 1st. All the Christian people have been taken away by force by the Greek troops. Those who had dared to disobey were massacred. The following old people were massacred and mutilated in their homes, Mrs Zubide Adhem, 40 years old, Mrs Dube Liche Chicho from Staria, 75 years old. Five children are missing. 3. Milets, 29 houses, 16 of them entirely burned May third. 4. Bezhani, Christian Albanian village, 90-100 houses, only one house was burned. At present only three families live there and about 20 old women. The rest of the population has been taken away by force by the Greek regular troops. Mr Lazi Dede, his brother and another man who refused to go have been massacred and horribly mutilated. There are three women and four children also massacred but not yet identified. 5. Zgorovoda, 38 houses in all, out of which 28 Christian Albanians and the rest Moslem Albanians. All the Moslem Albanian houses were burned, the Albanian Christian population taken away by force by the regular Greek troops. An old Christian Albanian, 55 years old, who refused to go, was massacred and horribly mutilated. There, two Moslem Albanians were massacred in their homes viz. Elias Maliq, 40 years old, and Nuri Abedin, 25 years old. 6. Kreshova, village of 26 houses, out of which 7 belong to Moslem Albanians, the rest to Christian Albanians. All the houses of the Moslem Albanians were burned. Two houses belonging to the following Christian Albanians, Lazo the Candymaker and Thani of Kreshova, were burned. All the Christian population was taken away by force by the Greek regular army. One man was found massacred, but not yet identified. 7. Staria, a Moslem Albanian village of 120 houses. One hundred houses were burned May 2. Mrs Sadije Lako, 65 years old, massacred and horribly mutilated in her house. Mrs Hassan Mustafa, 60 years old, massacred and mutilated. Mrs and Mr Qenam Elias and their daughter massacred and mutilated in their home. Qenam Elias 55 years old, wife 45, daughter 7 years old. Mr Redjep Elias, brother of the above-mentioned, 58 years old, massacred and mutilated in his home. Mr Shaban Latif, 40 years old, massacred with all his family. Wife 35 years old. Three daughters, one 12 years old, the second 10 years old, the third one 8 years old, and a son of 6 years old. All mutilated and torn to pieces. Mr Feizi Meko, 65 years old, massacred and mutilated, beyond description. Miss Lily Ysufi, 35 years old, born stupid, massacred and mutilated in her home. Mrs Chaush Beko, 45 years old, massacred and mutilated in her home. Mrs Chaush Beko's two daughters, one 16 years old, the second 14 years old, are missing. All the above-mentioned villages and half of the latter are in our hands. The rest, which we are going to mention below, are still in the hands of the Greek army. So we are in impossibility of giving full details of what has taken place there. 8. Psari, a Moslem Albanian village of 28 houses, was entirely burned May 2nd. Some people fled, the number of those massacred is unknown yet. 9. Bukova, a Moslem Albanian village of 29 houses. Twenty houses were burned May first. The number of those massacred unknown yet. 10. Herseka, a village formed of 18 Moslem Albanian houses, 8 Christian Albanian houses and 55 stores. All the Moslem Albanian houses and two stores belonging to them were burned May 2nd. Two old women, one from Tachi, the other from Herseka itself, were massacred, [identity] unknown yet. The following Albanian villages were either entirely or partially burned. Kodrasi, formerly 30 houses; Tachi the Inferior, formerly 60 houses; Tachi the Superior, formerly 50 houses, Mr Hassan Lulo, 50 years old, and his mother, 70 years old, massacred; Endrilikas, formerly 15 houses; Ripesi, formerly 18 houses; Prodani, formerly 24 houses; Ghionek, formerly 25 houses; Leshnja, formerly 55 houses; Barmashi, formerly 100 houses; Kagjinasi, formerly 45 houses; Navesela, formerly 100 houses; Sanjollasi, formerly 25 houses; Radimishti, formerly 50 houses; Kamniku, formerly 17 houses; Benjeza, formerly 45 houses; Rajani, formerly 40 houses; Mesichka, formerly 45 houses; Kurtesi, formerly 50 houses; Orgotska, formerly 40 houses; Lenska, formerly 20 houses; Zharkani, formerly 40 houses; Gadirchi, formerly 30 houses; Zagari, formerly 15 houses; Fusheza, formerly 10 houses. In Qesaraka, Mrs Satliane Kapo, 60 years old, her son Bahtiar Kapo, 25 years old, cut to pieces with swords. 1. Delvina, formerly 50 houses, out of which 14 houses were burned. The priest of this village with all his family was massacred in his own home. 2. Kuqa, formerly 50 houses, entirely burned. 3. Poda, formerly 20 houses, entirely burned. 4. Osetska, formerly 20 houses, entirely burned. 5. Radanji, 140 houses, entirely burned. 6. Vreptska, formerly 50 houses, entirely burned, eight persons massacred. 7. Kosertska, formerly 7 houses, entirely burned. 8. Kuqeshi, formerly 15 houses, entirely burned. 9. Sandropol, formerly 10 houses, entirely burned. 10. Peratti, formerly 8 houses, entirely burned. 11. Glina, formerly 40 houses, entirely burned. 12. Radatti, formerly 30 houses, entirely burned down. 40 people massacred and torn to pieces, but not yet identified. There are in Leskoviq section many other villages burned, but which ones we do not know yet, since this part of the country is still in the hands of the Greeks. 1. Gratsa, formerly 95 houses, entirely burned. All the inhabitants taken away by force by the Greek army April second. 2. Polloska, formerly 80 houses, out of which only 10 remained. 3. Nikolitza, burned by the Greeks, December 29th 1913. The following summer, its inhabitants began to return, rebuilding temporary barracks. 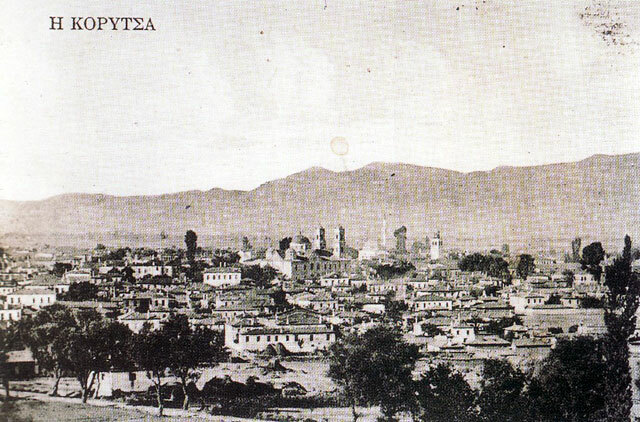 On Thursday at about 2½ a.m., the Greek regular troops attacked unexpectedly Nikolitza. The poor women and old people began to flee. The following people were killed while trying to escape: Mrs Keza Mahmut, 47 years old, Mrs Hysen Nikolitza, 50 years old, Miss Shaban Djelo, 10 years old, Mr Abdul Djelo, 50 years old, with his son of 4 years old. The following persons were wounded while trying to flee, Miss Batiat Choche, 16 years old, Mrs Ghulisha Airo Bey, 50 years old, Mrs Zanipe Feim Bey, 40 years old. Miss Qani Bato Bey, 15 years old, Mrs Nazime Abdul, 40 years old (wounded while watching her son of ten years wounded a few seconds before; her baby girl, 40 days old, killed in her arms, and her husband killed), Mrs Shnike Ismail, 70 years old, also wounded. 1. Frasheri, 150 houses, all burned down except one. 2. Selenitza, formerly 40 houses, is almost entirely burned. 3. Seropul, formerly 35 houses, entirely burned. 4. Kreshova, formerly 40 houses, entirely burned. 5. Kakos, formerly 20 houses, entirely burned. 6. Borotska, formerly 40 houses, entirely burned. 7. Pagri, formerly 20 houses, entirely burned. 8. Qesilesh, formerly 35 houses, out of which 6 houses burned. 9. Strenek, formerly 45 houses, out of which 6 houses burned. 1. Sevranji, formerly 120 houses, entirely burned. 2. Muzhentzka and Malinti are partly burned. The Greek regular troops taking possession of Kodra, a village near Tepeleni, invited all the villagers, men, women and children, to gather in the Orthodox church. When all were assembled, 230 in number, the Greek officers ordered the soldiers to fire on them with the machine guns. All were killed, their heads were cut off and were hung on the walls. General De Veer of the Dutch Mission went himself to this village, saw this terrible Greek cruelty and took the picture of this horrible sight. In Kortcha city and 8 surrounding villages, there are twenty thousand refugees. Immediate help is needed to keep them alive.